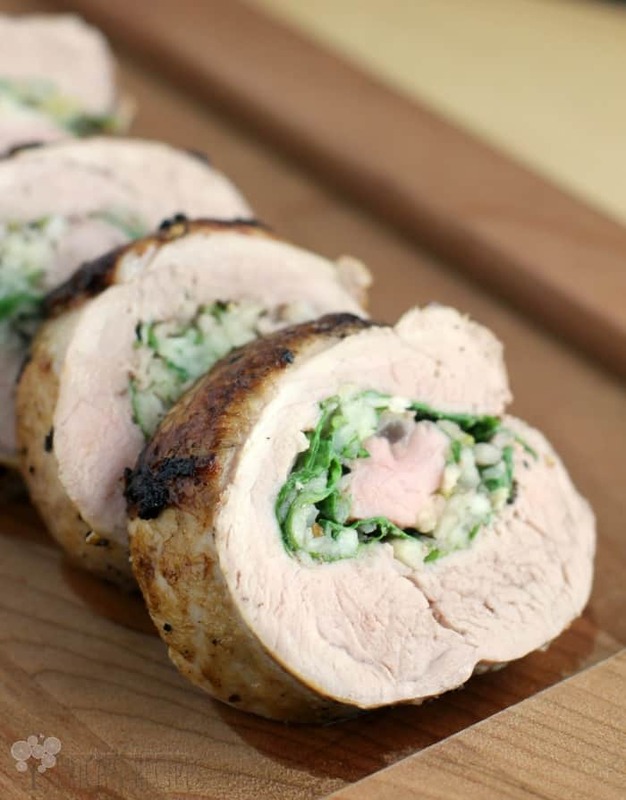 Juicy pork tenderloin stuffed with a light apple, fennel, and arugula slaw and served with a healthy Irish whiskey sauce made with yogurt. There is everything here to love about this delicious Healthy Apple Fennel Stuffed Pork with Irish Whiskey Sauce dinner. St. Patrick’s Day is next Tuesday! And I promised you with my Swiss Chard Potatoes Colcannon that I would have another recipe for you, so here it is. I don’t know if they make anything like this in Ireland, but I used Irish booze. So it’s related. …and the stuffing is green, so there we are. Do you get into food for festive days like this? St Patty’s, Cinco de Mayo, Chinese New Year, and such? It’s fun I think. Any excuse to cook of course, but then making meals with themes or from different cultures is just fun. ..because then you make little discoveries here and there. …like how well apple goes with pork. So what exactly do we do here… First, we butterfly a couple lean pork tenderloins, which is just slicing them without cutting all the way through, and beat them flat. Then there’s the sweet, light, healthy, simple, easy, awesome stuffing (notice no bread!). Stuff the pork and sear it – this serves two purposes: locking in pork juiciness and getting yummy browned yum-yums in the pan for our whiskey sauce. Then while the pork finishes in the oven, we deglaze the pan with the whiskey, strain, and stir in some creamy Greek yogurt for the sauce. Very easy. Very healthy. And as a cut, pork tenderloin is a forgiving meat (i.e. hard to screw up), so you got this guys. The flavors here come together in this perfect pork dinner that is just one of the best things ever. Apple and pork – and fennel, and arugula, and the whiskey – this is so so tasty. We’re talking umami magic. …and by the way, the leftovers are great too. Butterfly each tenderloin, then pound to ~1/2 inch thickness. Season with salt and pepper. 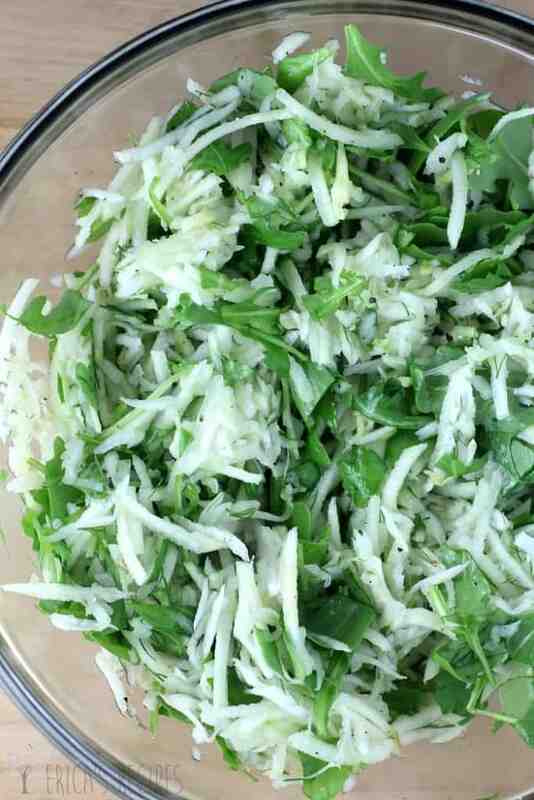 In a bowl, combine the shredded apple, fennel, arugula, 1 tablespoon fennel fronds and 2 teaspoons olive oil. Season with a good pinch salt and pepper. Spread apple fennel stuffing on each tenderloin. 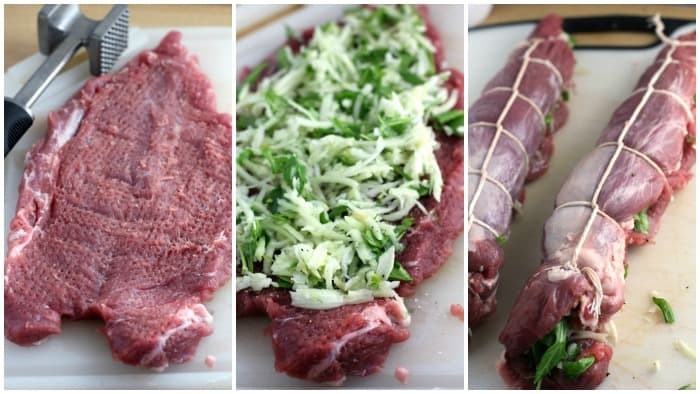 From the long side, roll up each tenderloin and secure with butcher's twine. Season the exterior of the pork rolls with salt and pepper. Heat the 2 tablespoons olive oil in a large skillet on high heat. One at a time, add a stuffed tenderloin and sear all sides. Transfer seared pork roll to a rimmed bake sheet. Repeat with the remaining tenderloin. 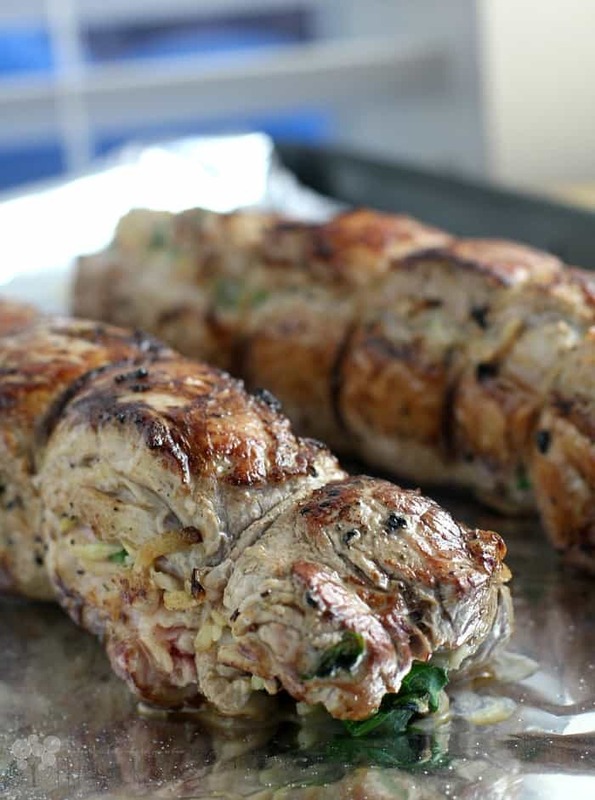 Bake the stuffed pork at 400F for 20-25 minutes until an inserted thermometer reads 155F. While the pork is cooking, deglaze the skillet with the whiskey. Do this very carefully if using a gas stove with an open flame. Cook until the whiskey is reduced to ~1/4 cup, using a wooden spoon to scrape up the browned bits. Strain the reduced whiskey into a small bowl. Add the yogurt, chives, and 1 tablespoon fennel fronds. Once done, remove the pork from the oven. Let rest 5 minutes before removing the twine and slicing to serve. Serve with the whiskey yogurt sauce. Yields: 4-5 servings. Hint: a food processor makes shredding the apple and fennel super quick. 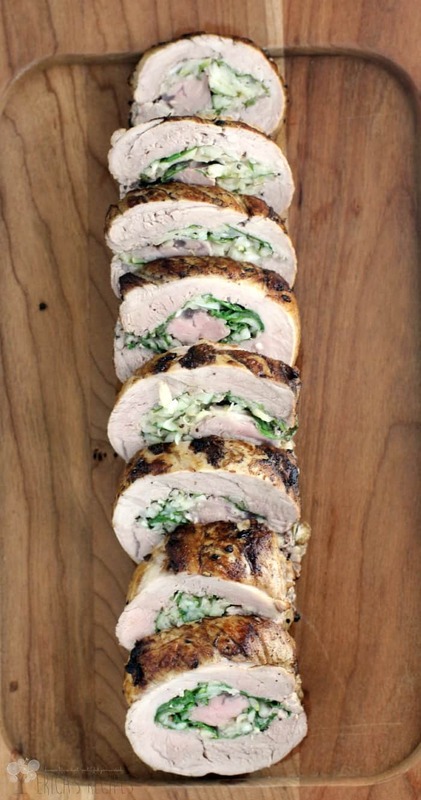 My favorite way to enjoy pork is the tenderloin and perfect with fennel. This sauce sounds delicious. 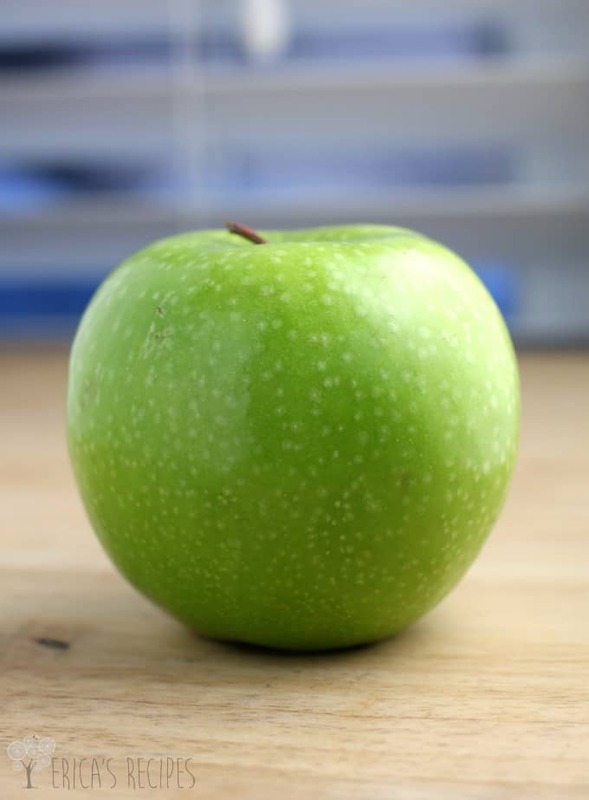 Great flavors of apple and fennel! What a gorgeous dish. It would be perfect for a dinner party too. Everyone would be quite impressed. Oh wow! This sounds absolutely amazing, Erica! 🙂 I always love apples paired with pork. I thoroughly enjoyed your lead in remarks. Made me chuckle. What a lovely recipe too! Fantastic way to serve pork and cheers to your whiskey sauce. YUM! Wowza! This is a stunning recipe Erica. I like it very much! Pork tenderloin is probably my favorite protein! I absolutely love it and this combo sounds delish. The sear and cook on your pork looks spot on! Love the filling and the cream sauce and you have perfect char marks on the pork. Oh Erica, this is a good one. I love apple and fennel together. I can only imagine how yummy this is. And the apple photo is awesome! We are just ALL over this one! Thanks for the beautiful and delicious inspiration! This recipe has stopped m in my tracks. I was looking over your recipes, saw this and knew it was the one. Yes, there are hearts in my eyes. Pork and apple are the perfect match! Delicious dish!